Barely noticed when it was first released, Ico has now become the #1 game to reference when bringing up the issue of art in games. But is it really all that and a bag of potato chips? Developed by SCEI (Parappa the Rapper, Shadow of the Colossus) and directed by Fumito Ueda, Ico is a third-person adventure game, set in a derelict castle that is situated on top of an island just a few hundred yards off the coast of some unknown continent. Cut-off by ocean on each of its sides, the castle becomes the player’s prison, so to speak. Ico is a young boy (his name is never referenced, so I’m only guessing it’s his name) that has been shunned by his village and sent to an empty castle to distance himself from society. Why, you ask? Because he grew two beast-like horns on his head, that’s why. Hey, it’s only fair. Ico discovers the source of Poland Springs. I’ll keep it at that. The story is somewhat vague; not many details are divulged while playing the game. How did Ico get those horns? Why are they considered bad? Nothing is really answered, but that in no way ruins the game. This is one of the fun aspects of Ico – you can create as many answers as your imagination allows. Many people who have played Shadow of the Colossus will say that that game answers most of the questions, but Ueda-san has never explicitly said they are related to each other, story-wise. There are many theoretical connections, but nothing exactly concrete. 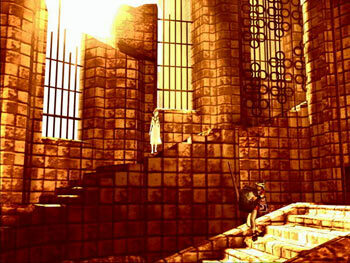 The meat of this game is the environmental puzzles that Ico must overcome while traversing the castle. Each section is an elaborate puzzle that forces the player to use his brain in order to get to the next section. It’s nothing as elaborate as a Prince of Persia puzzle, but it’s still complex enough to warrant a few minutes of consideration. Think of a more realistic Zelda puzzle and you’ll have a good idea of what challenges await you in Ico. Early on in the game you discover a young girl named Yorda, who has the ability to open certain doors. Most of the puzzles involve getting Yorda to a locked door, where she can then open it for you. This mechanic is probably the most memorable part of the game. 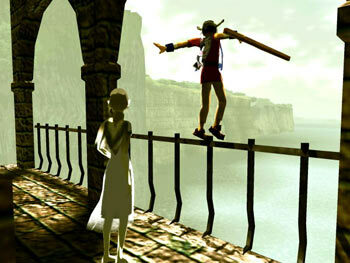 Yorda is not as nimble or as strong as Ico, so the player has to help her almost every inch of the way. She needs to be pulled up from lower levels, grabbed when jumping over small ledges, and have her hand held to make her come with you. The animation for each of these actions is done wonderfully, and really makes you believe that Yorda and Ico care for one another. Seeing Yorda almost fall into the ocean, with Ico quickly reaching out for her will surely make your heart skip a beat. Even though Yorda never really speaks, you can see that they grow attached from their interaction in the castle. Notice she isn’t in a rush to save him. Never have I felt such attraction to an NPC before. It wasn’t the story that created this feeling, either. It came from the physical interaction Ico had with Yorda, No amount of cut-scenes could make a player feel like this. I only wish more developers would look to Ico for more meaningful NPC interaction. 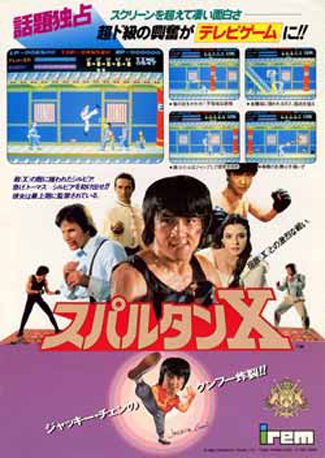 Other than the puzzles, the game employs a somewhat basic combat system. You only get one item at a time to use, but you do acquire more powerful weapons later in the game. When I first played the game, I hated the combat. You only use one button, and the weapon that you have for more than 50% of the game is completely useless. I actually stopped playing the game because of the combat mechanics. Once I came back to it, the only way I completed the combat sequences without frustration was basically running around like crazy, hoping I hit someone. Thankfully it worked, and I got to enjoy the game’s other, more rewarding aspects. The only enemy you’ll ever encounter is a misty-ghost creature that continually tracks down Yorda, trying to kidnap her. Once they grab her, they try to shove her into a black void and the game will end if she gets sucked in. Ico has about 30 seconds to track down the void and get her out of it. After growing accustomed to it, the combat becomes passable, but nothing that you’ll enjoy doing. Graphically, the game uses an unsaturated color palette that really looks fantastic. The castle truly looks like it has been eroded from years of ocean winds. In certain sequences, you can see farther parts of the castle, and it just looks amazing. The lighting engine that Sony created for this game is amazing, and has actually been used in other games like SotC. You’d think the owner of a castle could afford blinds. This, coupled with the fact that the environment has no living inhabitants, makes the castle an eerie place to traverse. It’s old and creepy but is also tranquil and beautiful. Certain areas have small patches of grass growing, adding a bit of color and life to the world. You can hear the waves of the ocean crashing against the cliffs just outside the castle, as well. This is where the issue of art comes in. The style that the game uses accentuates the feelings that the player goes through when playing the game. The unsaturated colors of the dusty, old castle. The warm, yellowish glow of the sparkling sun. All of it creates an atmosphere that goes far beyond anything that has been established before. Merely looking at Ico’s world will get you to finally agree that art does indeed live within code. I’ve always believed that, but Ico proves it. Simply put, the game is a marvelous experience for anyone the least bit interested in video games. If you can get passed the laughably basic combat, you’ll see that Ico is one of the best experiences you’ll have in the current generation, on any console. If you can find it, buy it. 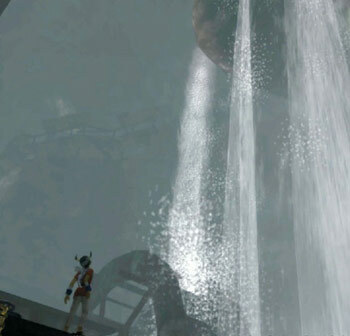 There’s a scene at the end of Ico in which the whole game has its "ah hah" moment, when the whole experience comes together and you realize just how far storytelling and emotion in gaming has to go, if such a game can be so potent with saying so very little. Sometimes I put the industy in a bad light, mostly concerning the intellectual level it tries to attain, but its pretty much true. The number of games that can be considered in the same light as books or movies can be counted on one hand. Eternal Darkness, Ico, Shadow of the Colossus, and Silent Hill are probably the biggest ones. And even Silent Hill falters in some respects. And I agree, we seriously have a long way to go to be considered the greatest medium of all. i was definitely one of those who didnt notice it and should have when it was first released. i picked it up in a bargain bin a couple years later and a college roommate actually played through it before i got around to it. you are right that the combat blows, but it actually adds to the experience in my opinion since ico is a boy who wasnt raised as a warrior (as far as we know) so if he was an expert swordsman it wouldnt really make sense. in terms of its relationship to sotc, there are some obvious parallels, and its difficult to believe they have nothing to do with one another, but to say it answers all the questions would be an overstatement. in general i think what both games (ico and sotc) tend to do very well is play on archetypes that we all understand since we were raised on fairy tales and stories with similar themes. as matt says, you empathize with these characters even though you know next to nothing about them. at least partially, this is because you recognize certain things about them from prior experiences. what both games did poorly is "have good gameplay" but that was completely excusable and will in no way deter me from buying any future games by team ueda and kaido. Very good comments, Pat. Good analysis of the theme of the game, concerning the issue of playing on archetypes. I will say, though, that SOTC had enough gameplay to say it wasn’t lacking in that department. It might have not been brimming to the top with features, but the sheer exhilaration while fighting those Colossi was enough for me. sotc was definitely better than ico in gameplay, but as you say (or imply) it was more about exhilaration and the experience than the gameplay itself. so maybe lacking is the wrong word, but the gameplay was not really the reason to play that. Well, you bring up a good point. I can sum it up with, "What is the very definition of gameplay?" If it’s pushing buttons and seeing something happen on screen, then you can say that. But it also be considered the experience that you have. You may not even have to push a button. Think of SOTC. Merely riding the horse around the colossus was amazing enough to say I had a good time. It might not have been as intuitive as some other games that employ a richer horse riding gameplay mechanic, but when I played SOTC, I had a far more enjoyable time than I would have with the other game. And you can consider that its gameplay. Something tells me I may be pushing the line a little, but I think its true. To this day, I have not played through this game and I wanted to play it when it first was described to me after its release. Sooner or later I will get this game.